These birds were always around, but I think I started noticing them only after seeing Shail Mohan share her fabulous pictures of her feathered friends. So, thank you dear Birdwali Aunty(a name coined by my daughter for her). She could be called the Dabboo Ratnani of the bird kingdom! Check out her snapshots here. Rainbow Hues recently posted…My Mojo! Totally………one day, main bhi birds click karoongi……..exotic wali! 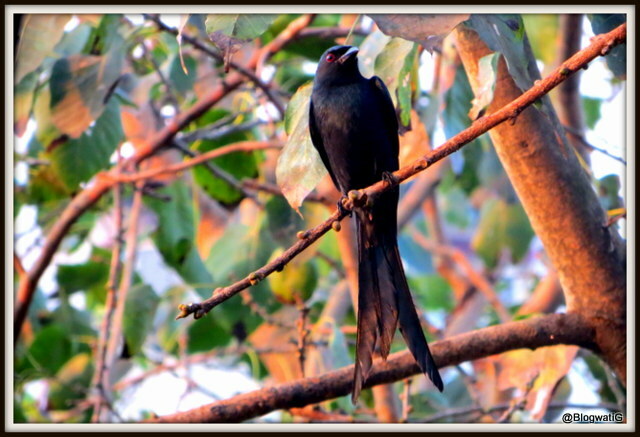 Drongo was one of the first birds we were taught to identify in school apart from the dear crow and darling sparrow of course 🙂 The fact that our Science teacher used to have Salim Ali as her neighbour was motivating enough to learn more about these birds. Wow, Salim Ali, eh? Lucky teacher and lucky you! Childhood memories are made of such stories. Thanks for sharing. Seeta, your Science teacher had Salim Ali as her neighbor? Wow! Lovely shot! And Shail’s pics are really amazing too! Roshni recently posted…My India trip in pictures! Oh yes, Shail’s pics are inspiring!